See Susie's review of this cookbook in her round-up of the best summer 2010 cookbooks at NPR plus two sample recipes. Susie also did a more complete review in The Boston Globe. Nice and sweet but lacked some oomph. Very tasty - the combination with vermouth and tarragon is a good one. Next time I want to cook them longer or at higher temperature, as there was too much bite and too much (and too thin) sauce even after an hour. Made this with frozen favas from Chinatown, frozen artichoke hearts from TJ's, and frozen peas. Very tasty, especially with some grated Parmesan. Nice & different. I used shallots. The children liked it, although they asked if I could decrease the amount of onion. I don't know if salt was omitted from the recipe on purpose, but I think it needs a pinch of it. Disappointing! After all the work preparing the artichokes, we just did not like the taste of the dish. Adding some soft goat cheese helped in the end. This is a nice salad with spritely flavors. Since my supply of parsley was a bit low, I added some of the leaves from the celery heart, and their yellowish green color contrasted nicely with the dark green of the parsley. Wish I had access to French radishes--but regular ones work just fine. I made this to accompany Ottolengi's Sweet Corn Polenta from Plenty. Nice salad, strong bright flavors. Liked cooking shredded potatoes this way. This was good, but it could have used more punch--maybe just more garlic and pepper. A sprinkle of Parmesan wouldn't hurt any, either. Such a simple yet delicious recipe! This has become one of my go-to lunch recipes when I can find sorrel. I only use 2 instead of 3 eggs, which is plenty. This is really wonderful. I used just regular sliced button mushrooms and canned beans, and served over polenta. Absolutely great. ...a fabulous way to eat your greens. It’s a little rich, but it’s also nice to see such humble greens turned into a decadent, silky mousse gilded with that luscious parmesan cream. 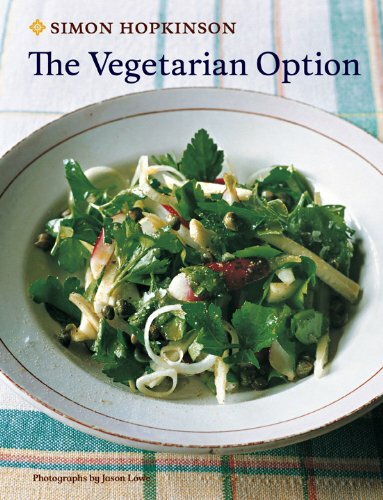 Not so long ago, vegetarian choices were an afterthought on restaurant menus or were relegated to side dishes at home. But times--and eating habits--have changed, and vegetarianism is being touted not just for health reasons but for environmental ones, too. Using fresh produce and combining seasonal ingredients have always been key to Simon Hopkinson’s cooking. Now, in The Vegetarian Option, the celebrated British chef focuses entirely on mouthwatering dishes without meat or fish. By pairing ingredients that naturally go together--eggplants with red peppers, tomatoes with olives, and peaches with plums, for example--he brings out the fullest flavor in foods. Vegetables take center stage in the book’s 125 original recipes, but there are also plenty of creative ideas for fruit, herbs, pasta, rice, legumes, eggs, dairy, and even cocktails. The Vegetarian Option is not written exclusively for vegetarians, but as a source of inspiration for all food lovers.